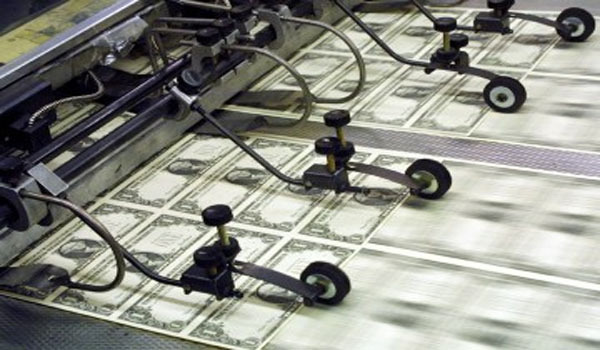 Pictured: the only thing the Federal Reserve knows how to do. Being an employee of the Federal Reserve, it is only natural for Yellen to have misguided faith in the organization’s ability to effect positive change. How could one function in the job without inducing such a delusion? However, it is still troubling to hear these thoughts spoken out loud, being fully aware not only of the ineffectiveness of the Fed, but the actual, tangible harm it does to the American economy on a daily basis. To Yellen’s credit, she was more moderate in her remarks than one might have expected. She did not endorse a new, supercharged round of quantitative easing. She did not even assert that the Fed could maintain financial stability through unilateral action. Nevertheless, her policy recommendations are mostly incoherent, and at times, dangerous. Yellen expresses the belief that monetary policy should focus on full-employment and price stability, with financial stability being a secondary goal. These goals are somewhat puzzling and contradictory knowing the ideological background of the speaker. The Keynesian view, to which Yellen subscribes, is that expansionary monetary policy creates demand, and therefore employment. Thus, to pursue full employment, it is necessary to continuously increase the money supply. On the other hand, Keynesians acknowledge the obvious truth that an increase in the money supply will inevitably lead to rising prices, quite the opposite of price stability. In fact, Keynesians have long held that inflation is in fact desirable in order to spur economic growth, just as long as it doesn’t happen too quickly. It is unclear how Yellen expects to use the tools at her disposal to create employment and keep prices stable at the same time. From the Keynesian perspective, this is a logical impossibility, especially given our current situation of high unemployment and rising prices (despite what the boffins behind the CPI would have you believe). The fact that the Keynesian view is wrong, and that increasing money supply does not in fact create jobs, only makes the plan worse than it already is. On the issue of financial stability, Yellen correctly acknowledges the futility of a central bank’s involvement, but then undercuts her statement by calling for stricter regulations on financial institutions, failing to recognize that federal regulations are what caused the housing crisis of 2007 in the first place. Possibly the most upsetting thing in Yellen’s comments is the unchallenged assumption that it’s the central bank’s job to incentivize risk-taking among businesses, as if a handful of bankers can possibly know how much risk private business owners should be willing to tolerate. The idea that it is within the Federal Reserve’s power to perform a risk-tolerance balancing act on behalf of others is ludicrous, but such ideas have contributed to the worst financial crises in U.S history. Yellen ultimately concludes that a “stay the course” policy of the Fed continuing to do exactly what it has been doing is appropriate for the current financial climate. While not the worst decision she could have made, it will certainly not make things better. The continued loose money policies of the fed can only result in an eventual correction, as the malinvestments made under misleading information fail to bear fruit. The longer we try to hold it off with expansionary monetary policy, the worse the correction will be when it inevitably comes.